Click the button below to add the Beauty and The Beast Watch Broadway Musical Black Gold LE Wristwatch to your wish list. Beauty and the Beast Watch, Walt Disney Broadway Musical, New. 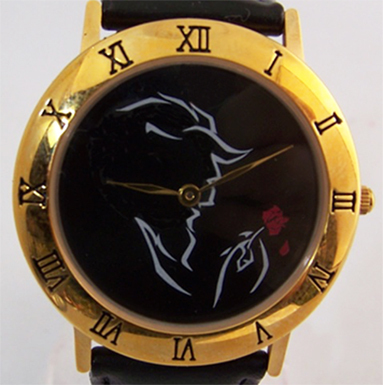 Walt Disney Fantasma Branded Black Image with Red Rose Wristwatch. Gold Tone Round Bezel Collectible Show Memorabilia, Gifts. 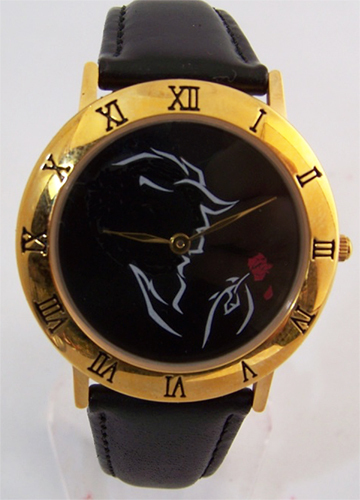 Beauty and the Beast collectors watch. Walt Disney Broadway Musical wristwatch. Features a round gold tone bezel with black logo image with red rose from the musical on the watch face. Case size round 34 mm, black leather band 18 mm., mineral crystal, Fantasma branded exclusively for Disney with three hand quartz Japanese movement. Stainless steel case back. This is a new, unworn working collectible sized for average sized men's wrist ( up to 7 1/2 inches), and a popular oversized womens wristwatch size as well: fits a 5 inch up to 7 1/2 inch wrist. 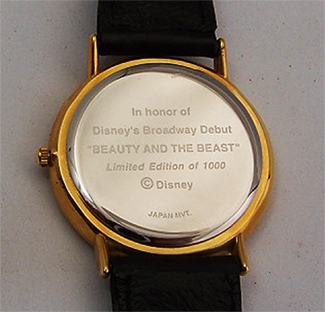 This is the most rare of the Beauty and Beast Broadway show watches, with a limited total of only 1000. This one is in new unworn working condition. It will ship either in the padded case shown or a black felt cloth watch pouch.